Love Youth Fitness Review & GIVEAWAY! Nestled next to a Dairy Queen and The Hot Dog Factory, there’s a studio where your pre-teens can dance themselves fit. 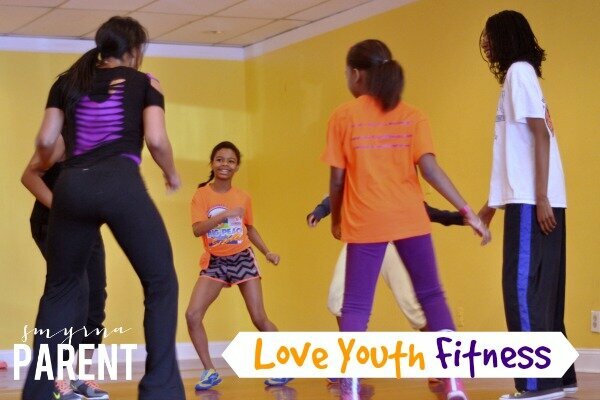 Love Youth Fitness operates out of the LL Fitness Studio (1529 Spring Road, Ste. C) and offers 2 different classes to get children and tweens fit and empowered, cleverly disguising all that healthy stuff with hip hop beats and dance moves. From the very first moments of the LYF Achievers class (9 – 13 year olds), it was apparent how much Reinye loves what she’s doing. Her energy is infectious and it’s a good thing, because she gets her class to WORK over the course of a 1 hour class. True to the fitness philosophy, there is a warm up, stretching, cardio, arm, and leg workouts, but as an observer, I truly couldn’t tell where the workout ended and the choreography began. The arm workouts were hidden in an energetic Bollywood track, the leg workout in some stepping moves. Besides the workout tracks, the students learn choreography during the latter half of the class. Reinye said that it takes about 2 months to learn a full routine, so it’s ideal if a student attends regularly, but the classes are drop in style and will still offer plenty to a student who cannot attend every week. Through it all, the students are encouraged to bring themselves into the dance by adding their own style and flair to the moves. In addition, they are given homework – both choreography and strength training moves to keep the momentum going throughout the week. LYF Achiever class cards can be purchased for $45 which includes 4 classes to be used within 6 weeks of the date of purchase, or you can choose the drop-in rate of $15 per class. While I observed an Achievers class, I also need to talk a little about Love Youth Fitness’ Explorers class for 4-6 year olds. Unlike the drop-in style of the Achievers class, the Explorers class takes the kids through 12 week sessions immersing them in either ballet, tap, jazz or hip-hop. If you’re thinking about enrolling your child in a more traditional dance class, but aren’t sure if they’ll love it enough for the full year, or aren’t sure which style to pursue, you can let them explore different styles during these sessions and then enroll them in a full program with a strong foundation and more confidence for both of you.